SHURflo Brix Pumps. Brix pump distributor stocking all Shurflo brix pumps. 5:1 Shurflo Brix Pump, 4:1 Shurflo Brix Pump and 3:1 Shurflo Brix pump in stock. All in stock. To order Brix Pumps please go to the catalog page. Other ratios available. Please call or email. The Brix pump is a proportioning device, which pumps two liquids (e.g. water and concentrate) in an exact ratio. 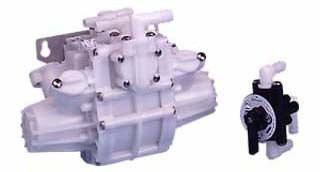 The particular ratio is determined by the pump design, and is thereby maintained precisely, independent of system flow or pressure changes, with no need to regularly readjust brix at the dispensing valve. The pump operates on the source pressure of one of the proportioned liquids; typically the incoming water eliminating the need for CO2 or electric power. The Brix pump is designed with a vacuum shut off. The vacuum shut-off will automatically stop operation of the brix pump, when the concentrate BIB container is completely evacuated, by closing off the water inlet. When a new BIB is installed, the pump will automatically resume operation without the need to prime the system. The Brix pump is ideally suited to premium juice applications, and incorporates a valve design suitable for use with syrups containing "stringy" pulp. The brix pump is shipped with the 3-way sanitizing valve.